Liberal Bohemian: Those Silly Reagans. Both Ronald and Nancy Reagan relied heavily on astrologers when making decisions, but they were not the first in the White House to do so. The lives of both Lincoln and Harding also relied on them. 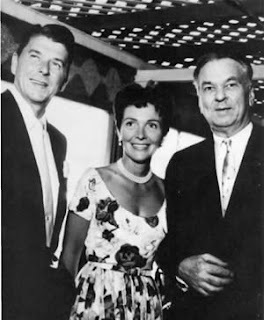 Reagan first became interested in astrology when he was a young actor, and he later got Nancy interested in it. From then on, their schedules were dictated by their astrologers—who included Jeane Dixon, Carroll Righter, Ed Helen, and Joan Quigley. British witch Sybil Leek claimed credit for Reagan changing his inauguration as governor from noon to just after midnight. 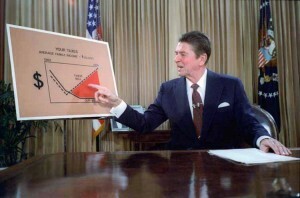 Ed Helin, who began doing Reagan’s charts in 1949, said, “As President, he was primarily concerned with the timing of events and how his popularity would b affected by his actions. he called me to determine the best timing for invading Granada, for bombing Libya, for launching the Challenger—things like that.” helix was paid by the Republican National Committee and was still doing work for them in 1990. If this isn’t Orwellian, I don’t know what is. On my way into work this morning I heard a report on NPR that stated “Americans Are Saving Less Than They Have Since 2007.” Interesting, I thought, remembering how that fact was true in my life, how after the George Bush meltdown of the economy and a bad-film investment, I was broke. Nice to know I’m still in the average. Then, I get in the office and imediately begin avoiding work by looking at the news feed on my favorite morning web search — which includes EsotericDaily.com — and I see this headline: Bloomberg: Americans Have Been Saving Much More Than Thought, New Data Show.